Set at some time in the near future, Tom Dulack’s The Road to Damascus (not to be confused with August Strindberg’s play of similar name) is set in a world not that different from our own, with terrorism and civil wars still the major problem for political leaders. A parable of 9/11 and the Bush Adminstration’s reaction to it, The Road to Damascus depicts a time when Miami and New York have been attacked by terrorists, with St. Patrick’s Cathedral and Rockefeller Center on Fifth Avenue the major casualties. 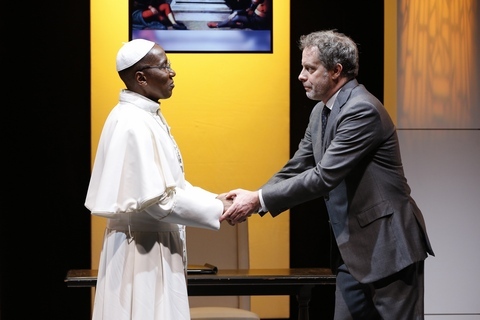 The play posits the first third party president in American history and the first Black African pope, a not inconceivable event in the near future. The U.S. has decided that Syria is underwriting the terrorists and has decided to bomb Damascus. The new Pope Augustine, only three months in office, has decided to travel to Damascus to prevent the bombing of innocent people. He has presented the U.S. with an ultimatum: either bring the case to the World Court or he will make this unprecedented trip, cementing a bond with the Muslim world for the first time in 1,200 years. This being the first time a pontiff has involved himself in foreign policy, American State Department diplomat Dexter Hobhouse is sent to the Vatican to see if a compromise can be worked out and keep the pope from making this historic trip. In Rome Dexter discovers that the U.S. is not revealing all it knows in the way of intelligence. While The Road to Damascus is very successful in depicting the workings of the corridors of power, its 13 scenes are nothing more than endless exposition, negotiations and meetings which – until the play’s last scene denouement – do not forward the plot much: the U.S. remains set on bombing Damascus and the pope continues to plan on making his visit to keep them from this course of action. As directed by Michael Parva of The Directors Company, the play is stylishly and gracefully staged, and the dialogue is believable and authentic-sounding. Unfortunately, as there is no action or decision made until the final few minutes, the play remains talky, languid, and ultimately tedious. The Road to Damascus is more like a screenplay in need of scenery and documentary footage than a successfully taut political stage thriller as the temperature never rises even with so much at stake. Some of the characters are stereotypes, others are nothing but ciphers, others have unbelievable accents. As the protagonist Dexter Hobhouse, Rufus Collins gives a quirky performance, partly based on his character’s bad boy reputation, three failed marriages, a Muslim girlfriend, etc. As that girlfriend Nadia Kirilenko, an investigative reporter for PanArabya Television, Larisa Polonsky gives a polished performance as a celebrated TV personality but her accent belies the fact that the character was born in Chechnya and was brought up by Belgian nuns. Mel Johnson, Jr. makes a most upright and urbane pope but he seems too young as well as not sounding African enough for this role. Joseph Adams as the U.S. Under Secretary of State is blander than any diplomat needs to be while Liza Vann as his opposite number at the National Security Agency is animated but strident and overbearing, revealing with whom the author’s sympathies lie. On the other hand, Joris Stuyck as a bishop attached to the Curia in the Vatican and also a former classmate of Dexter, is suave and diplomatically charming. Underplaying his role as the Vatican Secretary of State, a Portuguese opposed to the Pope’s plans, Robert Verlaque is menacing as a man of few words, suggesting what some of the other roles ought to have been. Brittany Vasta’s attractive and elegant unit setting fails to make the many locations in New York, Washington, Rome and on an airplane appear different, so that we feel we have been looking at the same stage picture all evening. However, Graham Kindred attempts to alleviate the situation somewhat by using different colored back lighting for each locale. Lux Haac’s costume design is traditional and conservative – not much you can do with career diplomats and clerics. Joshua Paul Johnson’s video design for Nadia’s TV broadcasts in the field is completely authentic but tends to stop the play dead in its tracks. Although Tom Dulack’s The Road to Damascus is an ambitious attempt to tell a cautionary political tale ripped from the headlines, it is much too long for the expository nature of the material. Everything either happens offstage or is reported to us, which makes this play very untheatrical. From the author of the long-running comedy hit, Breaking Legs, this is more than a little surprising.